Wasp is now available to recruit in Marvel Avengers Alliance (and probably needed to complete the next Spec Ops without spending gold). Her cost is on par with regular new heroes at 90 CP. Her abilities aren't terribly exciting but work well against "Protect" statuses. 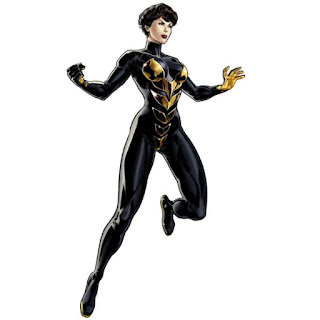 To avenge the murder of her father, Janet Van Dyne sought the help of Dr. Henry Pym, better known as Ant-Man. Pym's treatments allowed her to shrink or grow in size, and gave her the ability to fly and fire bursts of bioelectric energy. In time she left Pym's shadow to become a hero and leader in her own right, and one of the most steadfast members of the Avengers. Wasp is mainly a support character and a defensive one at that. Most of her attacks either prevent defensive abilities or reduce the enemies attack power. Her attacks themselves are relatively weak (although you can slots Iso-8s to change that) and it looks like most of her offense is generated off of counters that activate on her debuffs.